Looking for awesome things to do in San Diego with toddlers or young kids? Whether you’re planning a visit, a recent transplant, or a native looking for new ideas this list is full of great ideas for you! I was born and raised here in America’s Finest City, San Diego, and there are so many things to do I sometimes forget things. I’ve broken down the best ideas along with must-have information, costs, and any tips I’ve gained so far. You’ll find free activities up to the pricey ones. There is fun to be had on any budget! If you have any questions feel free to drop them in the comments. Enjoy your family adventures in San Diego! If your a lover of aquatic animals SeaWorld is definitely a place to check out! Though the famous Shamu show is no longer running there are plenty of attractions for kids of all ages. They even have a few roller coasters now! This can be quite an expensive trip with tickets, parking, and food but it’s a great day if you can swing it. Definitely look into the San Diego GO Card if you plan to visit SeaWorld while you’re here. I love dolphins so SeaWorld has long been one of my favorite attractions. Tickets: A single day ticket will cost you $69.99 if you buy online in advance, $89.99 at the gate. They sometimes have a promotion where you can save by visiting on a weekday for just $55. Children under 3 get in free with a parent. Parking: It does cost to park at SeaWorld…a whopping $22 so carpool whenever possible! Or grab an annual pass if you’re a native and get free parking. Things to know: Unfortunately, SeaWorld allows water bottles but no food or beverages into the park. There are plenty of available options to purchase. It’s called the World Famous San Diego Zoo for a reason. The zoo covers 100 acres and is home to over 660 species of animals! You’re sure to find you’re favorite there. There is a 35 minute guided bus tour that is included with the price of admission. This is one of the most popular things to do in San Diego with toddlers for local moms. 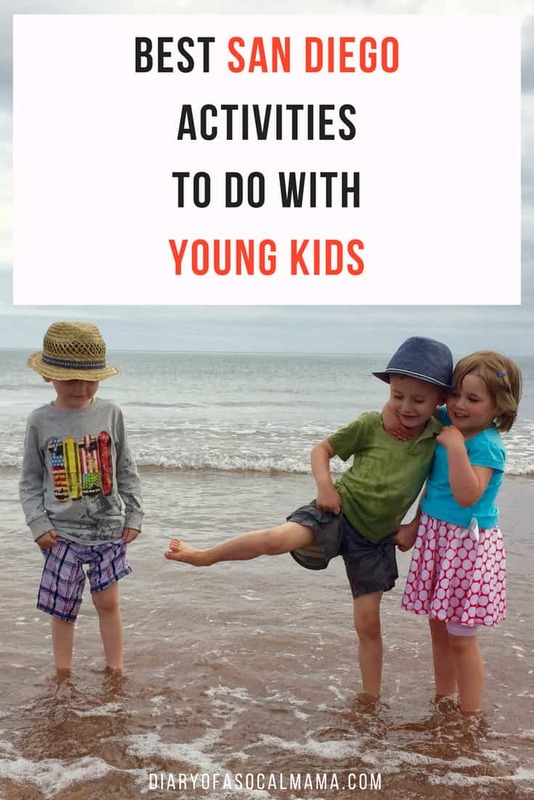 It’s a great place to wander around and keep the kids entertained. Tickets: Tickets are $44 for children 3-11 and $54 for adults 12+. Your ticket includes one trip on the guided bus tour, access to the express bus, as well as the Skyfari aerial tram. Parking: The zoo is one of the few places with free parking. The zoo sits adjacent to Balboa Park, a public park, allowing for the large free parking lot! Things to know: Be prepared to walk…a lot. Be sure to grab a map as this park can be a bit confusing to navigate at times. Luckily they have docents spaced throughout the park who are happy to direct you where you want to go. You can bring your own food and beverages into the park so long as they are non-alcoholic of course. However, coolers are not allowed so you’ll want to pack your snacks in a backpack. There is a lot of shade helping to keep you cool even on hot summer days. The Zoo and Safari Park are two of the few places where it’s actually worth it to buy the souvenir drink cup! Once you buy the cup you can bring it back with you for future visits to either park and get refills for just $1. The zoo is fabulous and well known, however, about 45 minutes north is a rather unique experience. the San Diego Zoo Safari Park, formerly known as The Wild Animal Park has all your typical animal exhibits. It also has a unique tram ride that takes you around a wide enclosure where many species of animals are mixed together in an exhibit meant to mimic their wild habitat. You can pay extra to take a bus out into the exhibit itself. The tram ride is free with your general admission ticket. Tickets: Tickets are $44 for children 3-11 and $54 for adults 12+. Parking: $15 for cars, $20 for RVs. Parking is free for Zoo members so be sure to carpool with a member if you know one. Things to know: The Safari Park is a bit warmer than the zoo as it’s farther north and inland. It also has less shade so pick a cooler day or go early in the day. There is a splash pad for young kids down by the Lion Camp so bring them a change of clothes and let them cool off when they need a break. There is also a petting zoo that my daughter loves! You can bring in your own lunch or purchase food and drinks in the park. Your kids may even get up close and personal with a lion like my little girl! Looking to save money on things to do in San Diego? Save big on your family adventures with the GO San Diego Card! The card is good for 30 days from first use and you’ll save 20% when you buy passes to 2 or more attractions with the Build You Own Pass option. With over 41 attractions available there are plenty to choose from! Even a local could make great use of this card while entertaining kids during the summer, or when friends & family come to visit. Visiting for a limited amount of time? Save up to 55% with an all-inclusive pass good for 1,2,3,5, or 7 days! Visit unlimited attractions all for one low price. Near the exit of the zoo and on the edge of Balboa Park you’ll find a cute little miniature train. Perfect for on your way out or just a fun afternoon adventure! Tickets: $3 per person age 1+. Children under 1 ride for free. Parking: Utilize free parking at the zoo or Balboa Park to ride the train. Things to know: The train runs from 11AM – 6:30PM and the ride lasts about 3 minutes. Children under 5 must ride with an adult. Near the entrance to Seaport Village is a beautiful historical carousel. After taking the kids for a ride stay and explore. Grab an ice cream cone at Ben & Jerry’s and check out the one of a kind shops that fill the area. I love going here with kids as well because you don’t have to worry about getting hit by a car or a bicyclist unless your on the outer coastal walk where you will meet bikes. They can run an explore a bit and it’s a unique place to visit. There’s even a pond where you can relax and watch the ducks. Go soon as they are planning a major remodel which will steal a lot of charm from this hidden gem. Parking: Parking can be tricky as there is not a lot of it. You can also easily reach Seaport Village via the Trolley with a short walk. If you have smaller children parking in the lot is probably the wisest idea or make sure you bring a stroller. Validated parking Monday-Thursday is $5 for the first 3 hours and $3 for each additional 30 minutes after that. Friday-Sunday parking is $5 for the first 2 hours and $3 for each additional 30 minutes after that. Things to know: The carousel runs from 10AM-9AM. The New Children’s Museum is a museum just for kids. With fun interactive exhibits and activities there is a lot to do for kids. Tickets: $14 per person. Under 1 get in for free. They also have very affordable annual passes. Parking: There is underground parking available at the museum or in nearby lots. Parking will cost $10-20 depending on the day and location. Things to know: Most exhibits are open to all ages but a few are restricted to those above or belove a certain age. For instance, at the time of writing this post, there are exhibits for age 4 and under only as well as one for ages 6 and up only. Some exhibits may get a little messy so it’s best to wear clothes you don’t mind getting dirty or bring a change of clothes with you. 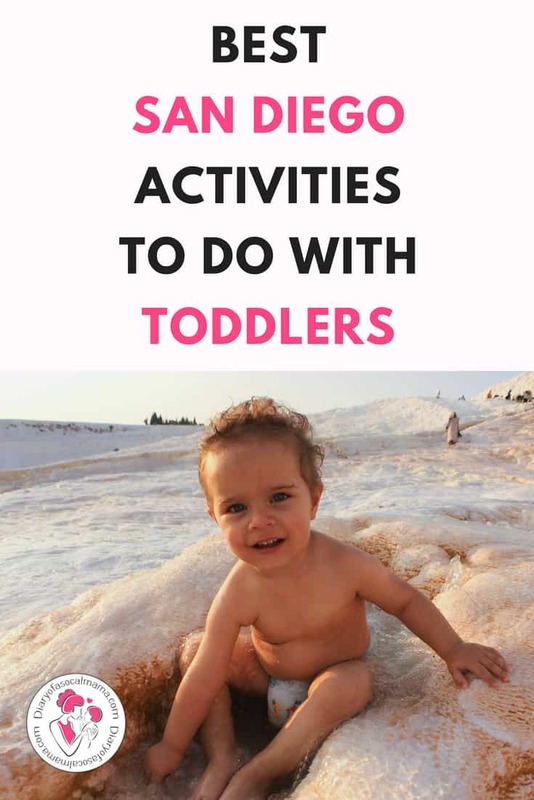 They have special toddler time every Friday at 10am. Check the schedule to see what’s happening this week! These events are free with the price of admission. This is a green museum and has little forced air or heat so it may not be ideal for the hottest days. Take a 15-minute ride across the bay to the Coronado Ferry Landing! Beautiful views and a fun ride. We took this trip when my nephew was about 3 years old and he was so excited to ride a boat! It’s a lovely view and the ride isn’t too long so you won’t have stir crazy kids trying to dive overboard. Once you get to Coronado there are shops or you can simply wander around and enjoy the lovely San Diego weather. Tickets: $4.75 each way. Children under 3 ride for free. Parking: There are several parking options within easy walking distance to the ferry. Things to know: There are two places to take the ferry from, but only one dock at Coronado. Make sure you catch a ferry to the correct return destination! The ferry runs from the Broadway Pier & the Convention center from about 9am-9pm. Check out the full schedule for details. Ready to grab some dinner fun? The Corvette Diner is a unique 50’s themed restaurant that now sits in Liberty Station. The restaurant also has an arcade tucked into one side so older kids can go play. My toddler enjoyed wandering around there as well even though she’s too young to play. The arcade is out of sight of the dining area so you will want to accompany your younger children over there. The wait staff will often break into song and dance or bring balloon animals to your table. There’s enough going on to keep the kids entertained while you enjoy your meal. Liberty Station is also home to a fancy movie theatre and many other shops and restaurants. Parking: There is free parking available in the lot behind the restaurant and throughout Liberty Station. Things to know: Liberty Station can be a bit confusing to navigate. Take your time and be patient. You may need to use Google Maps to guide you into this one. Seal Beach is a bit controversial in San Diego, but it’s a unique experience worth visiting. Originally this inlet was designed as a place for children to swim. But the seals like the calm harbor human created so much that they took it over. Now there’s a constant feud between proponents of letting the seals stay and those that want to chase the seals out and make it a place for children once again. I’ve lived in San Diego for over 30 years and the seals are still there! Parking: Parking is mostly street parking that may or may not be metered. There are also some pay lots within walking distance. This is a busy part of town and I highly recommend visiting during the week when crowds will be lighter. The actual address of the Children’s Pool is 850 Coast Blvd, La Jolla, CA 92037. Things to know: This is still a public beach and the public are allowed onto the beach and into the water. It’s recommended to stay out of the water due to sanitation issues created by the seals. You’ll smell the issue when you get down there most days. Please be smart and keep yourself and your children away from the seals, especially during pupping (baby) season. These are wild animals and they will bite if they are harassed, especially mothers with babies! Whale watching is fun and every trip is different. Most companies will give you a free 2nd trip if you don’t spot a whale or dolphin as you never know where they will be. This is the one item on this list that isn’t ideal for the youngest adventurers. For safety reasons, children under 2 are not allowed. The trip is 3 hours long so I would wait until your kids are a bit older and more interested in animals before bringing them on a trip. Things to know: Bring cash if you want to buy any snack on board. Make sure to bring some dramamine or bonine with you if you tend to get motion sickness. If you’re not sure if you get sea sick I’d take some just in case. You don’t want to be miserable the entire trip. The Birch Aquarium is a lovely little aquarium that sits near the campus of the Universiy of San Diego, California (UCSD). It includes a tide pool on the back patio that gives you a beautiful view of La Jolla and allows children to touch starfish and the like. The aquarium is not very big and can be visited in an hour or less, unless you really like looking at fish. Toddler and young kids will be amazed at the kelp bed exhibit. It’s a floor to ceiling aquarium full of a vast array of sharks and fish. Most days from 2-2:30 there is a feeding at the tide pool or the kelp bed. Check the aquarium schedule for full details. The aquarium is open from 9am-5pm. Tickets: $19.50 for adults, $15 children (3-17), $16.50 for seniors, $16.00 for students or UCSD staff, military receive $2 off and children under age 2 are free. Parking: There is free parking for 3 hours in the aquarium lot. Things to know: The parking lot is a bit of a walk from the aquarium so you’ll want to bring a stroller or drop off your toddlers at the front with one adult while someone goes to park the car. There is a small cafe as well as picnic tables just outside the entrance, perfect for having lunch before going on to your next activity. One of the most popular reasons to visit or live in San Diego are the beaches of course! There are plenty to choose from. Even your dog can visit the beach at Dog Beach in Ocean Beach. Every local has their favorite so ask someone about their favorite or simply find the one nearest to where you are staying. Just don’t visit Blacks Beach as it’s known as a nudist beach, although I’m not sure if you’ll really find anyone underdressed there these days! Coronado definitely has some of the nicest beaches if you want to make the drive out there but I’ve never been to a beach here that I wouldn’t visit again. Parking: Most beaches have free parking but it will get crowded on hot days. Mission Bay and Crown Point are generally slightly less busy areas, but are on the bay and not true beaches. Things to know: Alcoholic beverages are not allowed on the beaches in San Diego. Ok, so Disneyland isn’t exactly in San Diego. But if you’re this close it’s definitely a place to go. I had an annual pass for many years and will definitely have one again in the future since I live so close. Perfect for the whole family. Young kids can enjoy it as much as their parents. I do recommend skipping it if your kids are around 3-5 and are absolutely not going to wait in lines or sit in line in a stroller. You really just have to know your kids and what they can tolerate. No one wants a screaming kid all day at Disneyland. Tickets: $97 & up for adults age 10+, $91 & up for kids age 3-9. Kids under 3 are free. Things to know: To get the most out of Disneyland you definitely want to do some advance planning and research. Check out my cousin’s website The Pixie Dusted Planner for great tips and planning guides. She can even plan your trip for you if you’re coming from out of town. She’s Disney obsessed and knows all the ins & outs to get the most out of your trip! Such a great list of ideas! We’ve never been to San Diego but hope to visit someday. The zoo is at the top of our list, but I’m saving these other ideas too! There are so many fun things to do here! Beach, mountains, desert, and Disneyland all within a 2 hour car ride!